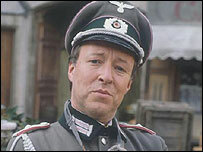 Sitcom 'Allo 'Allo, about France under the Nazi occupation, is to be screened on German TV for the first time. All eight series of the BBC comedy, which ran from 1982 to 1992, have been sold to broadcaster ProSiebenSat1. A BBC spokesman said the show "had not been picked up in Germany until now due to the subject matter". The show's 85 episodes, which poke fun at the Gestapo, French Resistance and the British, will be dubbed into German for its new audience. It is unclear whether the original show's comedy accents will be replicated in the German version. Isabelle Helle, head of German-speaking territories at BBC Worldwide, said: "'Allo 'Allo is one of the most successful BBC comedies ever made and is already loved in over 50 countries." She added they were "really excited" that ProSiebenSat1 had decided to take the entire run. The long-running comedy, written by David Croft and Jeremy Lloyd, became famous for the Germans' pursuit of an elusive painting called The Fallen Madonna With The Big Boobies. The show also gave rise to catchphrases such as "listen very carefully, I shall say this only once" from a sultry Resistance fighter, while a British agent who spoke poor French regularly used the greeting "good moaning". 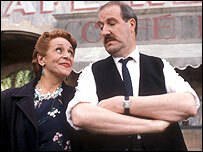 The central figure in the show was French cafe owner Rene Artois, played by actor Gorden Kaye. His on-screen wife was played by Carmen Silvera, who died in 2002. The television series spawned a successful stage tour from 1986, which also featured most of the sitcom's cast. In 2007, the show returned for a one-off special which reunited several members of the cast including Kaye.